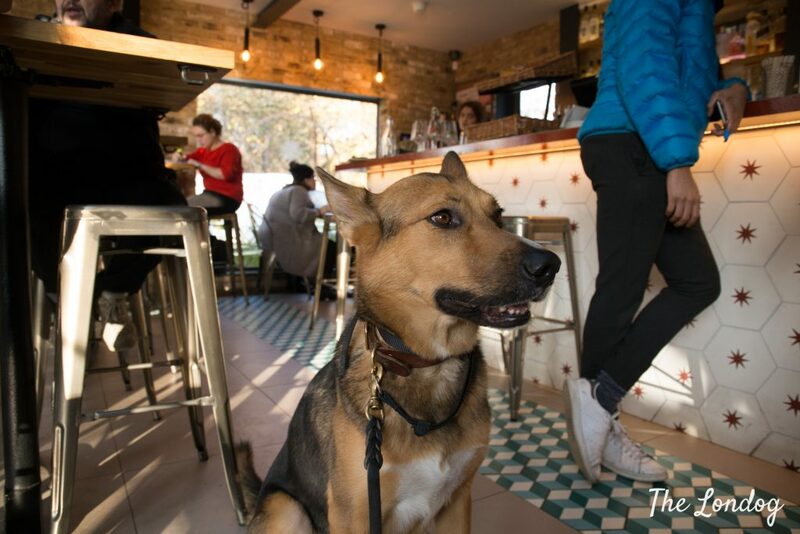 We have been on “dog-friendly crawl” among eateries, cafes, bars and hangouts in East London’s Bethnal Green, to map out the dog policies of local spots. 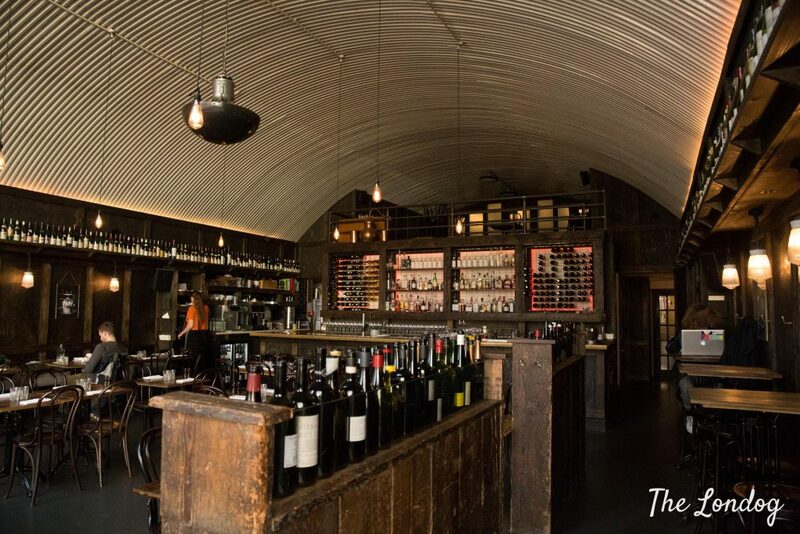 Today we bring you what we found with this guide, starting with the area between Bethnal Green tube station (on the Central line) and Cambridge Heath Overground station. Chiringuito is a Spanish and Latin American tapas/cocktail bar and restaurant, just paces from Bethnal Green station. 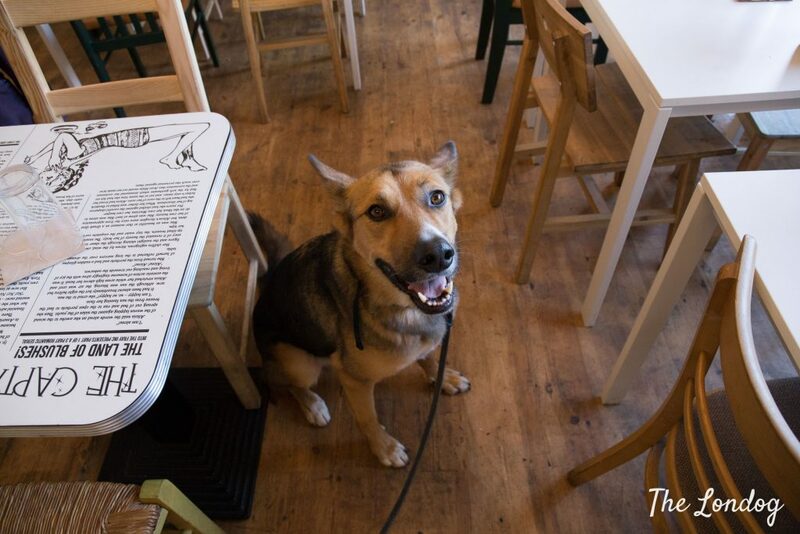 During our visit, the waiter made a big fuss of Argo and told us that they are 100% dog-friendly and adore dogs (in fact she let the cooks know and one of them appeared over the counter to give Argo a sneak peek with a very big smile). Chiringuito is a cozy place, with plenty of natural light coming from the large windows. Apart from the tables inside, they also have seating outdoor both at the front and on the back on a terrace overlooking Museum Gardens, as well as tables on the rooftop (which at the moment is closed for renovation, though). Dogs allowed: dogs of any size, everywhere. Menu and bookings: menu available here (same link for bookings). Resident of Paradise Row is a California inspired street food and cocktail bar. They serve burgers, tacos, small plates, Sunday roasts, and also have some vegan options. Resident has tables both indoor and on the terrace outside and dogs are allowed everywhere. They provide water bowls too. One thing to keep in mind when planning your visit is that it can be quite busy on certain evenings. UPDATE (February 2019): We are saddened to hear that Antonio passed away and his eatery has now been closed permanently. Antonio’s Kitchen is a little new restaurant in Bethnal Green that opened last Summer, with dishes 100% vegan. When I asked the founder Antonio whether they are dog-friendly, he said that it is more correct to say that they are dog lovers. They allow dogs and he even has an 11-year old Boxer called Carlotta, who he brought from Italy and is sometimes around at the restaurant. There is a plastic bowl with water for dogs at the back of the restaurant and, when we visited, Argo got some broccoli as a treat (which he loved). Their menu includeds starters, piadinas, pasta dishes and calzone. Love Shack was recently recommended to us by Zola Greyhuahua (@zola_greyhuahua – thank you!). They opened around May this year and are a little dog paradise. One of the co-founders, Jamie, with his Cockapoo Dalí, started a dog-friendly tradition and they offer a 15% discount to people bringing in their dogs (which I was told started for encouraging doggie play dates and making new furry friends). Later the crew was joined by Lettice the Havanese. 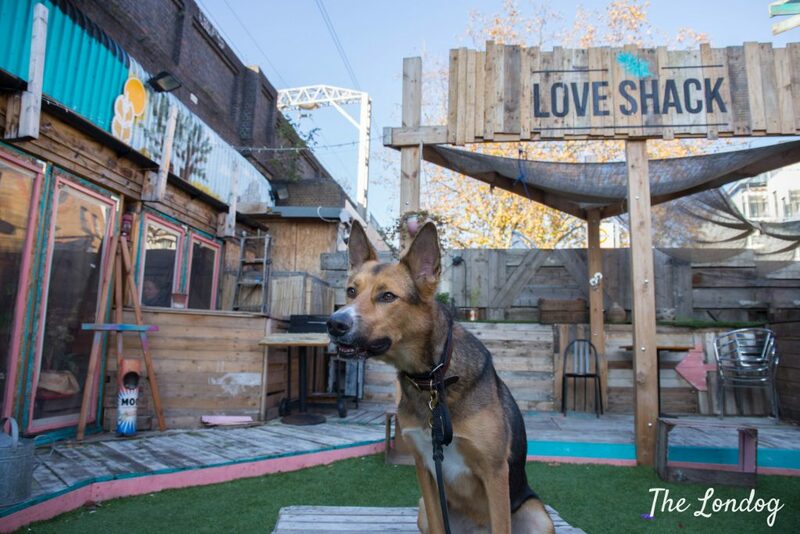 Love Shack, which describes itself as a plastic-free vegan paradise, has a colourful little garden/outdoor space, with fake grass on the floor, a veranda and an indoor part. They told me that they are currently working on some sustainable doggie snacks, reusing kitchen waste products, which are expected to be released in December. They are a community led venue and said that they are very open to proposals from the public and would love to host some dog training classes or small dog events in the future (just to keep in mind that the space is limited, so it cannot accomodate a large number of people and dogs). Love Shack’s vegan menu includes smoothies, breakfast options and other small dishes, and a dinner menu too, plus cocktails. 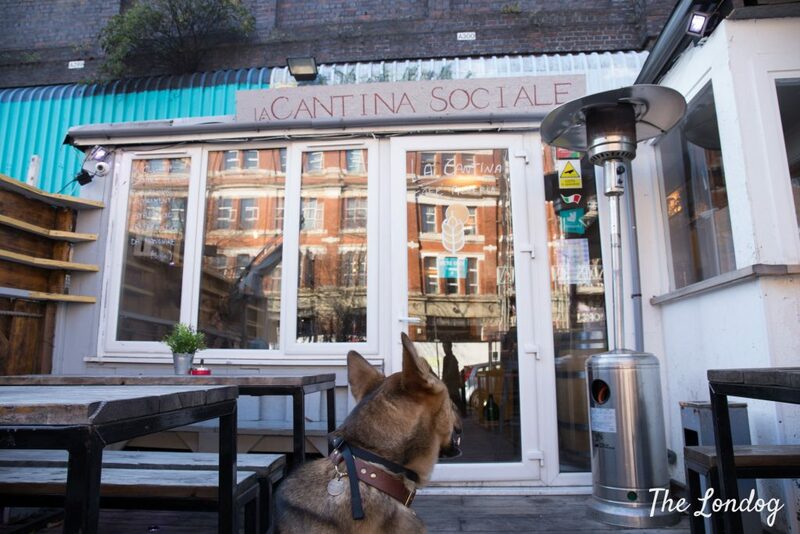 La Cantina Sociale is just next door from Love Shack and just before Cambridge Heath station. The founder (and cook) Girolamo is from Southern Italian region Pulia, and their menu is regional, so it includes pucce (typical sort of sandwiches), pizzas and other Southern Italian dishes. Girolamo explained that they are dog lovers and have an English Bulldog called Harry, who sometimes joins at the eatery. La Cantina Sociale is also a deli and take away. Hours: Closed on Mondays. The kitchen is open from 11am to 10.30pm, so you can have lunch or dinner. Sager + Wilde is a Modern European restaurant with an Italian twist. It is a cozy place inside, perfect for a date. We confirmed with them that they only allow small dogs inside, due to the tight space in the restaurant (they said that it becomes difficult for waiters to walk around the tables), but they accomodate any size of dog outside on the terrace. Music is played at medium volume. Arepa & Co. is a Venezuelan food eatery which, unfortunately, is dog-friendly only outside on the terrace (they said due to having an open kitchen). The Beehive is a small lovely cafe with big windows and a lot of light. They have a downstairs area for extra seating and some tables outside, in the little green at the front. 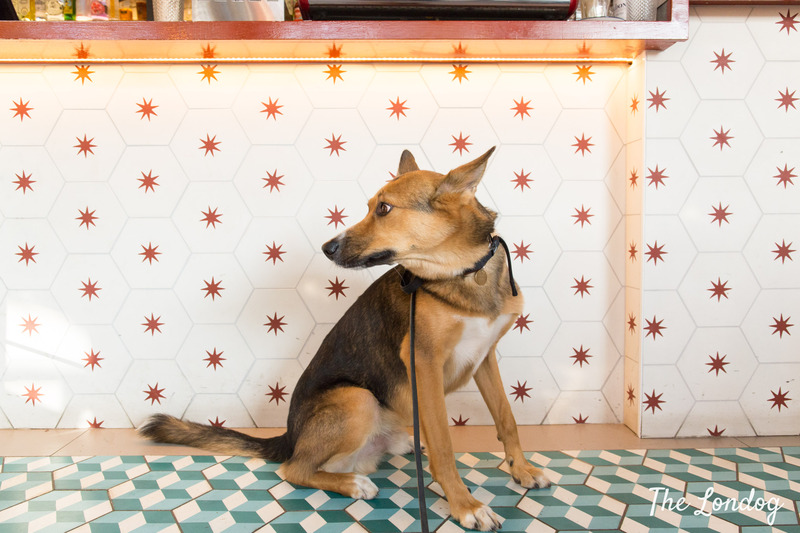 The Beehive is dog-friendly both inside and outside and has a dog water bowl at disposal, as well as dog treats. Dogs are just not allowed on/around the counter due to food on display. Nkora Coffee is a small cafe just opposite Cambridge Heath station. 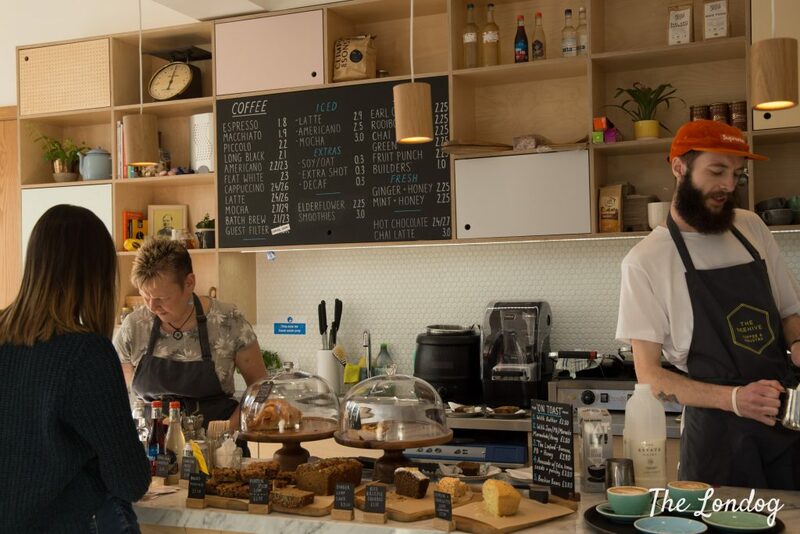 You can find coffee and drinks, and they also serve pots, sandwiches and cakes. It has a second branch, at the end of Hackney Road in Shoreditch (also dog-friendly, and which I love!). Mother Kelly's is a tap room and bottle shop, where you can find loads of craft beers from indipendent breweries. 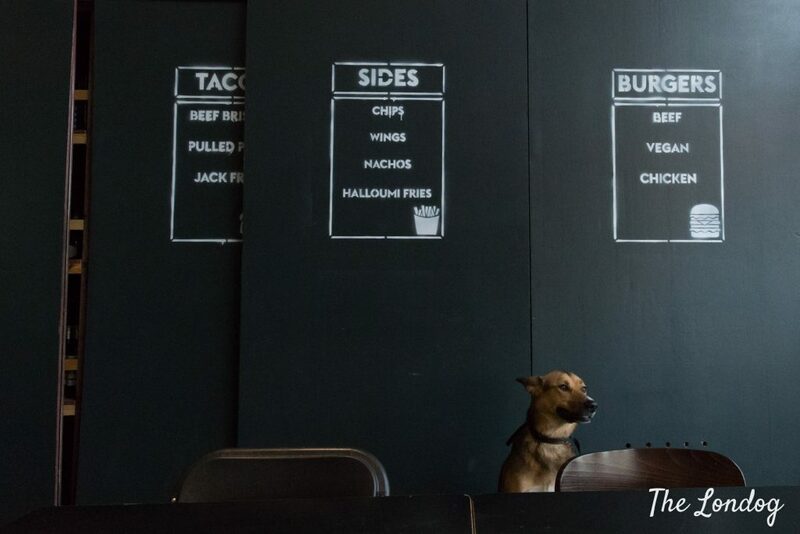 They have some snacks, while for a proper meal you can knock next door at one of the dog-friendly eateries reviewed above. Mother Kelly's has a dog water bowl and dog treats and they said that quite a few people bring their dogs in. Since they often play music and under the railway arches the sound makes a bit of echo even when the music is not too loud, it can be a good idea to chill out outside on the terrace with your dog in those instances. 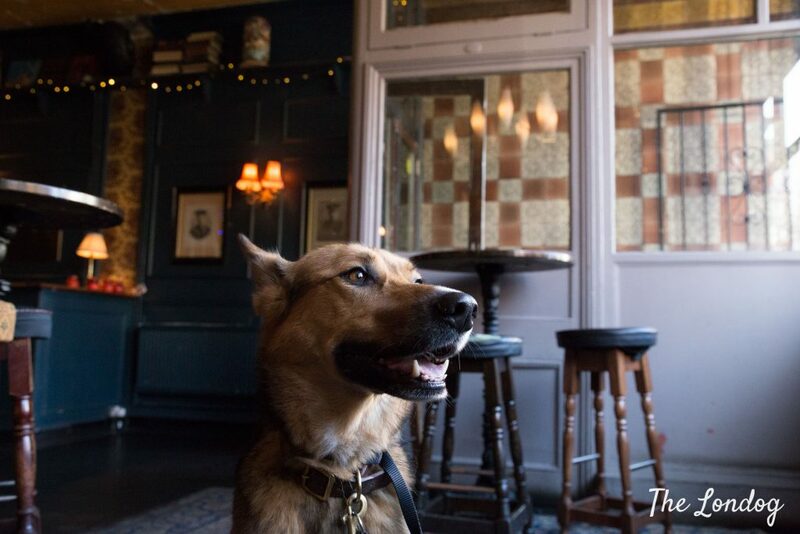 The Dundee Arms is a pub serving almost exclusively drinks (they only have snacks and grilled toast). The manager told us that they love dogs and customers often bring them in. They have a dog bowl (which he offered to Argo during our visit). One thing to keep in mind, though, is that they play loud music and have DJs at the weekends/on selected days too, so better not bringing your dog on those nights. 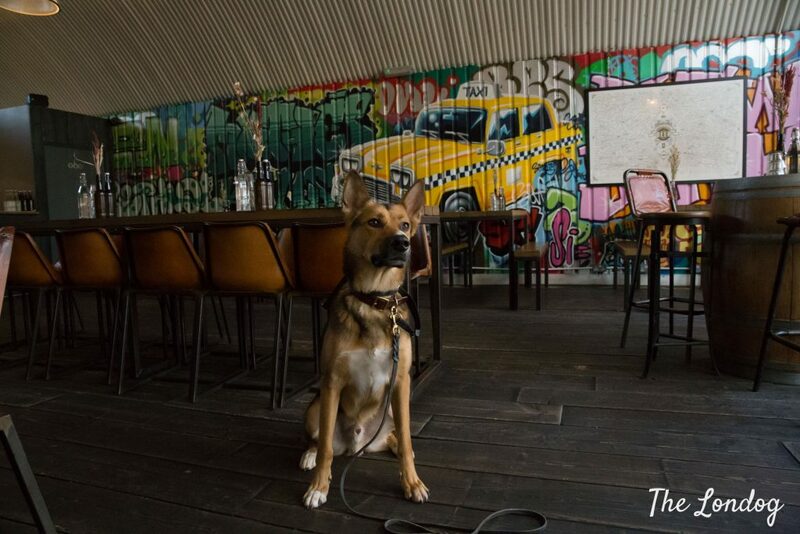 The East London Hotel is apparently dog-friendly, but the personnel was unable to comment, so we will update this post as soon as we receive more information from the management. The Town Hall Hotel is an elegant hotel offering rooms and reception venues. It has been a dog-friendly venue for a while and the consierge explains that they used to have a hotel dog: a greyhound called Dizzy, the dog of the general manager, who recently retired and now comes to the hotel every now and then. He shows me a display case where there are two copies of Dog magazine, open on the two pages featuring Dizzy, she made it in the press! We confirmed that all rooms of the Town Hall Hotel are dog-friendly, but dogs are not allowed in the restaurant (nor in the gym and in the pool), so owners have the choice of either leave their dog in the room or have breakfast in their room. An extra fee applies for dogs, which is £25 per night, to cover extra cleaning expenses (and a £60 deposit). They have a list of banned breeds which includes dog breeds that are illegal in the UK, plus a few others, so check in advance. A curious thing is that in the hall there is a bowl with two fish and a little sign: it says that you can spend the night with Nelson and Nancy (the two fish) having them in your room for £10 a night, with proceed going to a charity chosen by the hotel. 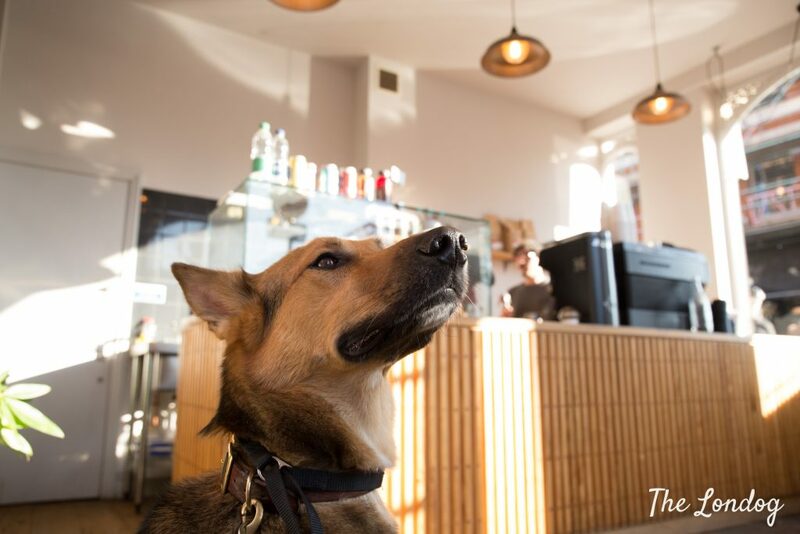 Woolidando – dog friendly café and plant shop, corner of Bethnal Green Road and Barnet Grove. Thank you, Keith! Sounds lovely, will check it out.